OGDEN, Utah – Thanks to a partnership with Utah Clean Energy and the local community, Weber State University’s Sustainability Practices and Research Center (SPARC) is making it easier than ever to add solar power to homes. On May 28, WSU is launching the Susie Hulet Community Solar Program, one of the first-ever university-led solar purchasing programs. Through a community volunteer committee, the program will help community members purchase affordable residential solar paneling, using bulk-buying power to negotiate significant discounts with competitively selected installers. Through the program, citizens are eligible for a more affordable and more simplified solar installation process. The program is named in honor of the late Susie Hulet, a longtime advocate and benefactor to nature and sustainability programs, who worked with the Environmental Issues Committee. Inspired by recent success at the University of Utah – which installed solar panel systems on 380 homes in its campus community – Susie and her husband, Elliott, first tested the program on their own home before joining forces with Weber State. The program is the newest addition to WSU’s innovative sustainability efforts. Weber State was named to the Sierra Club’s Cool School rankings in 2014 and was recently designated as a Tree Campus USA for the fourth consecutive year. On April 22, WSU also will be listed in the Princeton Review’s Guide to Green Colleges for the fourth straight year. The community is invited to attend the first solar power workshop May 28 at 5:30 p.m. in the Dumke Hall of the Hurst Center for Lifelong Learning. There, people can learn more about the program, meet the solar energy installers and have their questions answered. 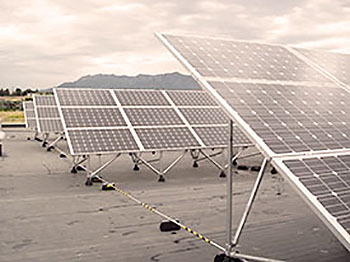 Citizens are also encouraged to visit weberstatesolar.org, where they can sign up or obtain more information.